Marvel Television is proud to announce Eisner-award winning superstar artist Paolo Rivera (Daredevil, Amazing Spider-Man) as the newest recruit for Marvel’s Agents of S.H.I.E.L.D. : The Art of Level 7, a new landmark initiative bringing top artists from around the world together to celebrate the final six episodes of the series’ inaugural season(airing Tuesdays, 8|7c on the ABC Television Network). Following the latest jaw-dropping episode of Marvel’s Agents of S.H.I.E.L.D., Rivera’s piece brings fans a special look at Coulson’s team after the discovery of S.H.I.E.L.D.’s true nature. As the Agents struggle to combat a threat unlike anything they’ve ever faced, they’re unaware that a greater one lies closer to home! “Providence”, the eighteenth episode of the series, premieres on Tuesday, April 15th, this week at a special time of 9|8c. Each poster released in this series will be available as limited edition high quality prints at http://www.marvelstore.com/ArtOfLevel7 with “Providence” scheduled to go on sale Friday, April 11th at 1:00am PST. These individually numbered prints are strictly limited to 100 copies and once they’re sold out, they won’t be available again from Marvel. 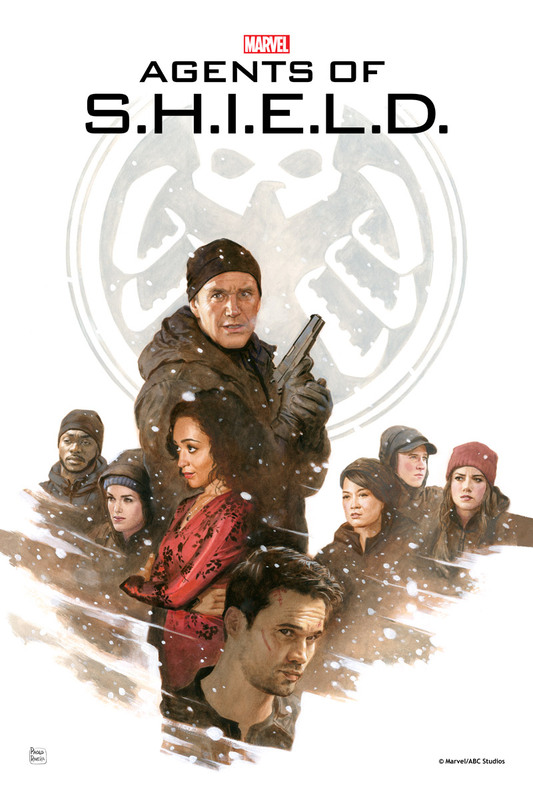 Tune in on Tuesday, April 15th at 8/7c to catch a special encore presentation of “Turn, Turn, Turn,” followed by the world premiere of “Providence” on the ABC Network as Marvel’s Agents of S.H.I.E.L.D. airs with new episodes every week through to the shocking season finale. For more information on Marvel’s Agents of S.H.I.E.L.D., please visit www.marvel.com or www.abc.com. Join the conversation on Twitter and get all the latest updates with @AgentsOfSHIELD and @Marvel. “Marvel’s Agents of S.H.I.E.L.D.,” Marvel’s first television series, was co-created by Joss Whedon & Jed Whedon & Maurissa Tancharoen (“Dollhouse,” “Dr. Horrible’s Sing-Along Blog”), who also serve as executive producers along with Jeph Loeb (“Smallville,” “Lost,” “Heroes”) and Jeffrey Bell (“Angel,” “Alias”). “Marvel’s Agents of S.H.I.E.L.D.” is produced by ABC Studios and Marvel Television. ABC Studios is a leader in the development, production and strategic distribution of entertainment content across broadcast and emerging digital platforms. The studio is the key content provider for the ABC Entertainment Group, having produced multiple seasons of hit series, including “Scandal,” “Once Upon A Time,” “Grey’s Anatomy,” “Desperate Housewives,” “Lost,” “Castle” and “Revenge”; as well as “Army Wives” for Lifetime and “Criminal Minds” for CBS. These hit series have supplied the company’s distribution pipelines worldwide with programming and related product lines. ABC Studios continues to produce memorable television programming, including “Marvel’s Agents of S.H.I.E.L.D.” and “Trophy Wife” for ABC and the summer series “Mistresses”; along with “Perception” on TNT, “Cougar Town” on TBS and “Devious Maids” on Lifetime.